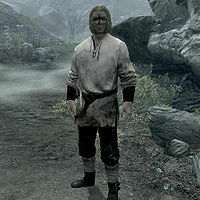 Perth is a Breton miner who works in Soljund's Sinkhole, a moonstone mine directly east of Markarth. Upon approaching the mine's entrance, he stops you, warning that it has been overrun by draugr. After completing the quest to clear the mine, you can sell moonstone ore to him for 30 gold and he becomes a potential marriage candidate. Before you have cleared the mine, Perth will stand near the entrance around the clock, waiting for you to arrive, and will continue to do so until you surface (see bugs). Once the mine is clear, he will start his daily routine. He sleeps in the Miner's House every night between midnight and 7am and starts the day with a one-hour breakfast. At 8am he heads into the mine and works for twelve solid hours, interrupted only by one-hour meals in the house at noon and 5pm. He finishes work at 8pm and spends the evening inside the house, occasionally talking to fellow miner Tuthul. Perth wears a set of miner's clothes along with a pair of boots. He wields a pickaxe and carries his key to the miner's house along with a selection of lower-class loot and gold. When you arrive in Soljund's Sinkhole for the first time, you will find Perth near the mine entrance, along with a Reach Hold Guard. When he sees you, he will actively seek you out and warn you: "Whoa, there. I don't know where you're going, but stay out of that mine. It isn't safe." You can choose to ask what is wrong with the mine, or tell him that you go where you please. The former option will net you an explanation: "We tunneled into an old Nordic crypt. The whole place is crawling with draugr. We're not mining up any ore with those undead around, so I wouldn't go down there if I were you." The latter option will make him say: "Fine, but there's a whole crypt of draugr underneath the mine. We're not going in there until the Jarl's men come to clear them out, so I wouldn't go down there." Due to a bug, you will not have a choice, as the quest will start immediately after his response. He will add: "We're keeping the mine closed until that crypt is clear. ", "I hear talk about a regiment coming to clear the crypt out. We'll see if that happens." and "There's still plenty of ore left in that mine. What a waste." When you surface after clearing the mine, Perth will be waiting outside. When you tell him the good news, he will be grateful: "You did? We were waiting for the Jarl to send an entire regiment to clear that mine. Now we can get back to work. Thank you." He will then hand you a leveled gold reward and will start to greet you with: "Mining out this old rock is a lot quieter, now. Thank the Divines. ", "Hard to believe there'd be an old crypt underneath the mine." and "We're getting back to work as best we can." Tuthul: "'We're safe' he says. You'll eat those words when a draugr is tearing into your face." You were supposed to have a choice whether to help Perth or not, but the quest will initiate right away, leaving his dialogue lines unheard in-game. (Yes) "You're joking, right? Those bone-walkers will tear you limb from limb. But if you want to get yourself killed, go ahead." Perth's dialogue for buying and selling ore has no audio. This page was last modified on 2 September 2018, at 22:07.